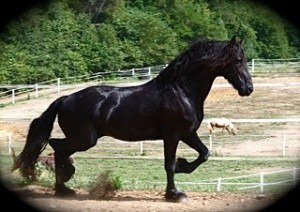 Outstanding Friesian gelding horse for sale. He is great with all ages, is not very spooky, and is also great for trails. No bit, whip, or spurs required. Voice commanded, knows how to longe. Stands perfectly for farrier, grooming/bathing, and mounting. Very affectionate, can go along time without being ridden, without developing behavioral problems. Up to date on coggins, deworming, and teeth.